Sony has revealed its new smartphone app, Imaging Edge Mobile, offering 'instant' image transfer for casual users and background FTP uploading for professional use. The app, which replaces the maligned PlayMemories Mobile, will be released in March and complements the existing Imaging Edge desktop software, which will itself receive an update this month. 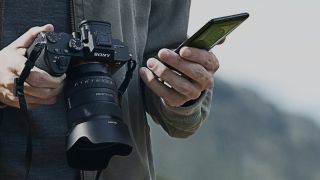 The new mobile version boasts an 'Auto background transfer to Smartphone' function for instant file transfer and easier social media sharing – making it a good fit for the just-announced Sony A6400. It also offers 4K movie transfer (for compatible cameras) and remote control functions, all of which will be useful to casual users. However, the app has an additional component that's geared towards professional shooters as well. The Transfer & Tagging add-on enables photographers to streamline their workflow using the FTP background transfer, providing "instant delivery" while they continue to shoot images. Also making life easier for pros on the go, the add-on supports voice input for text and captioning as well as the ability to sync Caption Glossary between multiple devices. Whether professionals will genuinely use a phone app to upload and catalogue their photos remains to be seen, but it's certainly a notch above the image transfer apps from other manufacturers.